Last year the newest, most unique, cupcake item was CupShakes. 2010's new cupcake invention is Push Cakes. Meringue Bake Shop's new item is based on one of my favorite childhood treats, push pops. 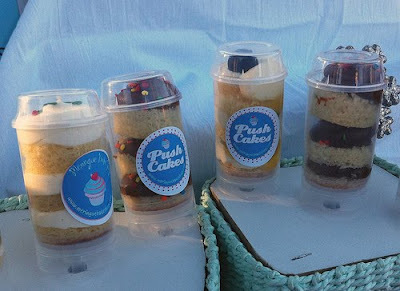 Push Cakes are clear tubes stuffed with layers of cake and frosting. You push up from the bottom to reveal more cupcake goodness. 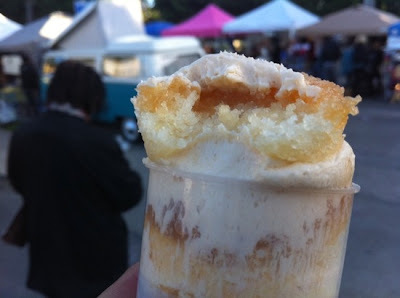 You can find Meringue Bake Shop selling her signature cupcakes and Push Cakes at the Great Park Farmers Market every Sunday from 10a-2p. Stick A Fork In It has reported that Push Cakes are $3 or 2 for $5 and so delicious. I can't wait to try one myself! Oh! My! Gosh! I can't wait to try one of these! That is my favorite farmers market in all of OC! OMG!!!! I love this! I going to hunt these down! I can't wait to try them myself. I would love to hear from someone who has tried them.